THE STORY - Salvatore "Sal" Fragione (Danny Aiello) is the Italian owner of a pizzeria in Brooklyn. A neighborhood local, Buggin' Out (Giancarlo Esposito), becomes upset when he sees that the pizzeria's Wall of Fame exhibits only Italian actors. Buggin' Out believes a pizzeria in a black neighborhood should showcase black actors, but Sal disagrees. The wall becomes a symbol of racism and hate to Buggin' Out and to other people in the neighborhood, and tensions rise. THE BAD - The score and some uneven performances​. ​​​It has always been my personal belief that when it comes to filmmakers such as Spike Lee, he is of a very rare breed. Say what you will about the man’s personal politics and controversial statements, there are still few directors who are able to capture such striking commentary as Lee. In times when even the most respected filmmakers can barely make anything that has reach beyond artificial artistic merits, Lee is someone who uses the art form to constantly delve into important topics and find something truly revealing to say. He is without a doubt one of the most important filmmakers working in the industry. This is a statement made with confidence by the mere existence of this film: a vibrant work of art that has as much relevance today as it did nearly three decades ago when it first premiered. The story revolves around a sweltering summer day in a tightly knit New York City community. At the center of this sprawling ensemble is Mookie (Lee), the lethargic delivery man for the neighborhood pizza shop, run by Sal (Danny Aiello) and his two sons Pino and Vino (John Turturro and Richard Edson, respectively). Mookie’s trips take him on interactions with the neighborhood’s self-appointed elderly council Da Mayor (Ossie Davis), his more matriarchal counterpart Mother Sister (Ruby Dee), the high energy agitator Buggin Out (Giancarlo Esposito), the expressive girlfriend Tina (Rosie Perez), the stoic music man Radio Raheem (Bill Dunn), the stern sister Jade (Joie Lee, Spike’s real-life sibling), and the smooth-talking DJ Mister Señor Love Daddy (Samuel L. Jackson). These people, along with many other individuals, find themselves trying to survive not only the blazing summer day but also traverse the high-tension racial divides that slowly build up to a devastating climax. As one can see, it is truly amazing the incredible ensemble that was assembled for this film. The performances shine in every aspect, and one is immediately taken by these characters. Standouts will vary on who is commenting, but specific attention could be called to Davis and Dee. The pair, who were married in real life, find so much warmth and soul to their portrayals. The banter they share, while brief, is endlessly fascinating and humorous, while both also manage to find a great depth to their own world-weary perspectives, flaws and all. With so many shades of diverse viewpoints in this neighborhood, theirs comes from a place of reverend experience that does not need to be taken at face value. Their wisdom is fraught with lessons, all interesting to explore. Even still, they are not the only members of this cast worthy of praise. While it is a shame that Aiello received the film’s sole acting nomination from the Academy (Made more problematic by him being one of the few white performers), it’s still quite easy to be taken by this gruff yet tender man who has to balance his affection for the community with his own moral compass dealing with his background and family. Speaking of family, Turturro and Edson embody the duality of the problematic white perspective that can be bestowed. Pino’s overt racism both antagonizes the community and blinds him to his own hypocrisies. Vino’s well-intentioned friendships border on appropriation and a misreading of the delicate social contract. Both actors carry these themes well in their performances and further enhance the film’s messages. One could go on and on about this incredibly able cast. Esposito is great as the fiery and energetic instigator, Dunn’s quiet strength emboldens Raheem with a dignified undercurrent, Perez is a ball of energy that mesmerizes in every scene, and Jackson is all charms as the Greek chorus-like DJ popping spirit into the story with soulful dialogue. There’s even a trio of old timers making commentary from their chairs that is uproariously entertaining. Truly the only weak parts of this cast are the Lees, Spike, and Joie. By no means terrible, it just means that when stacked up against a lineup of very capable actors who exceed in their roles, the pair is left to serve more as functionality for their characters. Again, not to diminish them too much, it’s just not exemplary work like the other members of this cast. However, one could forgive Spike Lee for not delivering the best of performances because what he has delivered as a filmmaker is an amazing gift. The combination of his script and direction breathes life into a colorfully vibrant world that is at constant odds with its conflicting residents. He shows this as a community that lives together but also carries an air of hate, seemingly exacerbated by the boiling temperatures until it metastasizes, breaking out into a whirlwind of anger and tragedy. Lee does not make the audience a passive viewer; we are thrown into this world with complicated characters who will not always fit a perfect box of whatever we may deem to be unanimously proper or moral. Still, that is what makes this world even more interesting, and all credit to Lee for helping craft this world, along with some strong assist from the luscious cinematography from Ernest Dickerson and the attentive editing by Barry Alexander Brown. Now, it must be noted that any reasonable discussion of this film must include the film’s ending, a point of contention that still raises much debate even today. It won’t be delved into too deeply here, for consideration of those who may not have seen the film and want to experience it first-hand themselves. What will be noted is an observation that one’s reaction to the conclusion of the film seems to be heavily influenced by specific worldviews, and it is another example of Lee’s brilliant method of storytelling. In those moments, one cannot help but to simply refer back to the command of the film’s namesake. Doing the right thing is always easier than it sounds, and throughout the entire film, it is a lesson these characters are constantly at odds with. You as a viewer may find yourself agreeing or disagreeing with certain actions, which is inherently the point. The beauty of this film is the ability to generate a discussion about the value of life, property and the sense of safety within a community, and what it means to meet those terms. It is a powerful statement the film leaves you with, and all the more credit to the filmmakers for being so bold. This film will turn thirty years old next year, and it is astonishing how much resonance it has many decades later. Topics of gentrification and police brutality leap off the pages of today’s headlines, and it is a credit to Lee for being able to so accurately capture the complicated feelings that are represented in this world. His storytelling craft is impeccable, and with a fantastic group of actors at his disposal, it only elevates the material even more. There are a few points of contention one could argue, with the biggest one being the score that I personally found incongruous with many of the film’s scenes (A common complaint I have with many of Lee’s films). However, they pale in comparison to the monstrous achievement the film manages to accomplish. 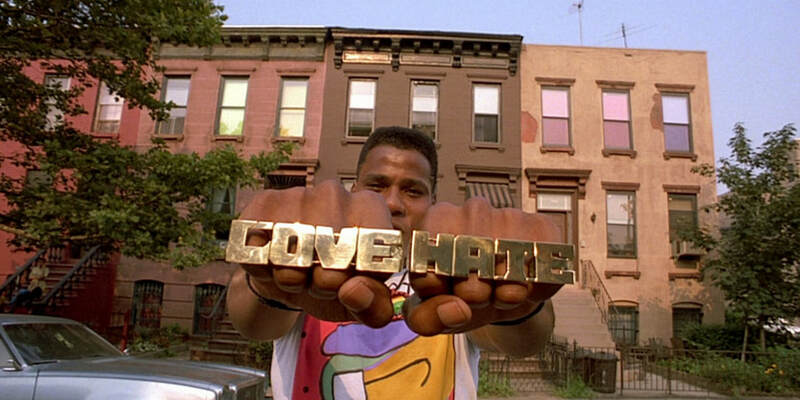 There is a reason this film has earned its rightful place as one of cinema's greatest endeavors, and there is nothing but respect and admiration for Spike Lee’s masterpiece.